sit-stay-play hosted our 2nd dog walk meet up at Morrow’s Meadow in Yorktown this evening. 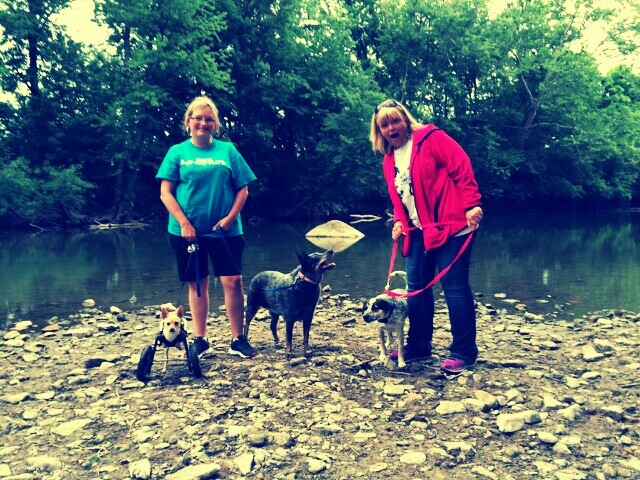 Two of our clients brought their dogs and Mother Nature played nice, thank goodness. The light sprinkles didn’t disrupt anything and the sun even peeked out from the clouds. The Yorktown Farmer’s Market was in full swing and people were buying sweet corn, fresh vegetables and yummy sandwiches from Grand Grilling to Go. The park had a few other people walking their dogs and a large group of volleyball campers at the pavillion. Once Sonny saw these young ladies he made a beeline to say hello. He doesn’t know a stranger and thinks everyone wants a kiss! Lilee and Lucy were good sports, they showed Sonny the river and once he realized he could go in, he proceeded to venture out, drink some water and try to maneuver in his wheelchair. Poor fella couldn’t get around that well so I think I’m gonna have to buy him a life jacket and get him in the river WITHOUT his wheels. We had good walk although it was probably a lot slower than Lilee and Lucy are used to. Sonny’s little legs couldn’t go as fast as his buddies but despite this, everyone seemed to have fun. If you like to do activities with your dog and enjoy the company of others, please join us at any of our dog walking events. Our third meet up this month is tomorrow morning, from 8am-9am, at Canan Common’s in Muncie. p.s. Thank you to Randy and LeAnn for bringing your dogs out tonight! !